Well, this embarrassing. I opened up my text editor and found the following article. What with one thing and another happening around the maison, I forgot to post the following announcement. 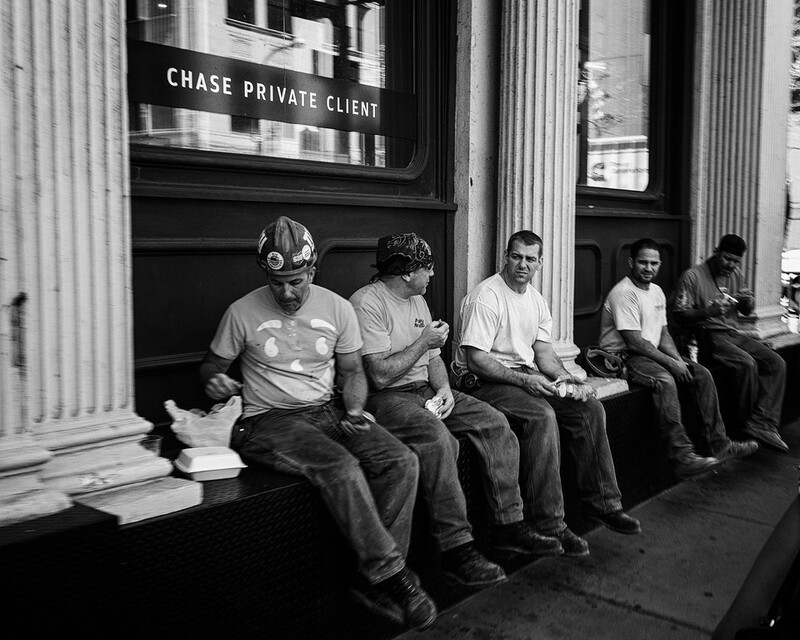 I’m pleased to announce the publication of my latest photobook, “Working Stiffs: The People”. This is a collection of images is dedicated to the men and women who get things done. You know, the ones who deliver the beer, make sure the traffic flows, make sure that the lads don’t get out of control. The ones who build our buildings, clean our streets and catch our fish — the overlooked, the unseen, the ignored, the spoken down to — are the ones without whom our urban world would quickly grind to a halt. I started on this project about a year ago and after some twists and turns prints have been pulled and a book published. You can go have a look at the book by following the link in the sidebar (and buy one). "Windex cures more than arthritis and tennis elbow" It's true! Best print head cleaner ever! Remove the print head, soak in about 1/8" of Windex for 24 hours, wipe with distilled water (the real stuff, not just Brita filtered) and your're good to go. Monitors are too bright; turn them down to 80% (at least) and then calibrate. This gives you a fighting chance pulling a print that comes close in luminance to what is printed. To get even closer (at least for black and white prints) order the calibration print from Ilford Labs, download the the calibration file and tweek the monitor so the file and the print match. Paper makes the difference. When I started printing, I softproofed in Lightroom and printed on some off the shelf Canon Super Glossy II paper. The result where OK but not what I remembered when I was printing in the darkroom all those years ago. I settled on Moab Juniper Baryta paper and the results where stellar. It was like looking at the Ilfobrom Type 3 resin coated paper I cut my teeth on all those years ago. Keep the book layout simple. I decided on a minimalist layout. The hard bit was deciding on a typeface that was reflected the subject matter and wasn't a distraction to the image. I ended up deciding on the DINPro typeface in varying weights. Blurb's software doesn't recognize OpenType fonts: I needed to change my OpenType fonts to TrueType. Come on Blurb, that should be a no brainer. NIK Silver Efex is still the best Black and White tool out there. Franzis BW Projects 5 is getting close and I like some of the effects. I'm going to work with it a lot more. I wish Google would just opensource NIK and be done with it. The world doesn't need more abandonware. Run a checklist. Being solo means no external eyes to do QA or QC, make sure you're exporting files properly, proofread, spell check and provide feedback on layouts, sequencing and all the million things that go into an enterprise like this. Be ready for the unexpected turn. In doing the photo selection, I discovered I had another project at about the same state as when I started this one: "Working Stiffs: Tools of the Trade" Given the speed I work at this should be ready this time next year. Some photographers are of the school that holds "A photograph isn't exist until it's printed". I have to agree with that. There's an intense satisfaction in seeing the image emerge from whatever process you use. The Working Stiffs galleries are here.